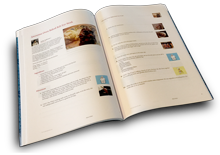 Order a professionally printed, perfect bound cookbook with a full color glossy cover and 19 recipes. It's cheaper to purchase at Amazon. Hello Michelle, looking through your cookbook made me hungry for lasagna again. Thanks for including one of my recipes to your cookbook. Wouldn't be awesome if someone had a lasagna night where you got to have a choice of different lasagna's to taste? I remember seeing on one of the shopping networks where you can buy a pan that has three separate spots for lasagna, so you could make different types if you wanted. I think that would be a fun pan to get. Hi Michelle- thank you for including my mini cream filled delights in your cookbook. I feel very honored!